Janus Activated Kinase (JAK) 2 plays an important role in the pathogenesis of myelofibrosis (MF). Ruxolitinib (INCB018424, Jakafi) is a potent dual JAK1 and JAK2 inhibitor. In November 2011, it became approved by the US FDA for the treatment of intermediate or high-risk MF. This review shall outline the role of Ruxolitinib in the current management of MF and its potential future. Context: Antracycline-Cyclophosphamide (AC) along with Paclitaxel/Docetaxel, either in combination or sequential regimens, is showing superior results than Anthracycline-containing regimens. Aims: This study was designed to determine whether adding Paclitaxel to a standard adjuvant chemotherapy regimen AC for breast cancer patients would prolong the time to recurrence and survival. Settings and Design: Randomized, prospective, open-labeled, single-institutional study. Materials and Methods: Fifty stage II breast cancer patients accruing 25 patients in each arm, treated between July 2007 and January 2010, were included in the study. Initial surgical treatment was Modified Radical Mastectomy. Systemic therapy was to have begun within 4-6 weeks of the patient's surgery. In the control arm, all the patients were treated with six cycles of adjuvant chemotherapy with AC regimen repeated at an interval of 3 weeks. For the study arm, the patients received adjuvant chemotherapy with three cycles of AC regimen followed by three cycles of Paclitaxel, repeated at an interval of 3 weeks. All the patients of both the arms received locoregional external beam radiotherapy (EBRT) after the entire course of chemotherapy. All the hormone receptor-positive patients received Tamoxifen. Statistical Analysis Used: Statistical analysis was performed using the chi-square test and the Kaplan Meier survival analysis with the log-rank (Mantel-Cox) test. Results: Adding Paclitaxel to AC resulted in a statistically significant disease-free survival. The overall survival was also improved significantly. The toxicity profile in both the arms was comparable. Conclusions: In early and node-positive breast cancer, the addition of three cycles of Paclitaxel after completion of three cycles of AC improves the disease-free and overall survival. Breast cancer is known from ancient time,and the treatment strategy evolved as our understanding of the disease changed with time. In 460 BC Hippocrates described breast cancer as a humoral disease and presently after a lot of studies breast cancer is considered as a local disease with systemic roots. For most of the twentieth century Halsted radical mastectomy was the "established and standardized operation for cancer of the breast in all stages, early or late". New information about tumor biology and its behavior suggested that less radical surgery might be just as effective as the more extensive one. Eventually, with the use of adjuvant therapy likeradiation and systemic therapy, the extent of surgical resection in the breast and axilla got reduced further and led to an era of breast conservation. The radiation treatment of breast cancer has evolved from 2D to 3D Conformal and to accelarated partial breast irradiation, aiming to reduce normal tissue toxicity and overall treatment time. Systemic therapy in the form of hormone therapy, chemotherapy and biological agents is now a well-established modality in treatment of breast cancer. The current perspective of breast cancer management is based on the rapidly evolving and increasingly integrated study on the genetic, molecular , biochemical and cellular basis of disease. The challenge for the future is to take advantage of this knowledge for the prediction of therapeutic outcome and develop therapies and rapidly apply more novel biologic therapeutics. Aims: Imaging-guided biopsies obtain samples for pathologic testing in addition to therapeutic interventions in patients with cancer. Our aim was to determine the diagnostic accuracy of percutaneous biopsies of pediatric solid tumors and infectious complications of cancer treatment. Materials and Methods: This study was performed by gathering pediatric oncology patients between 1998 and 2008. 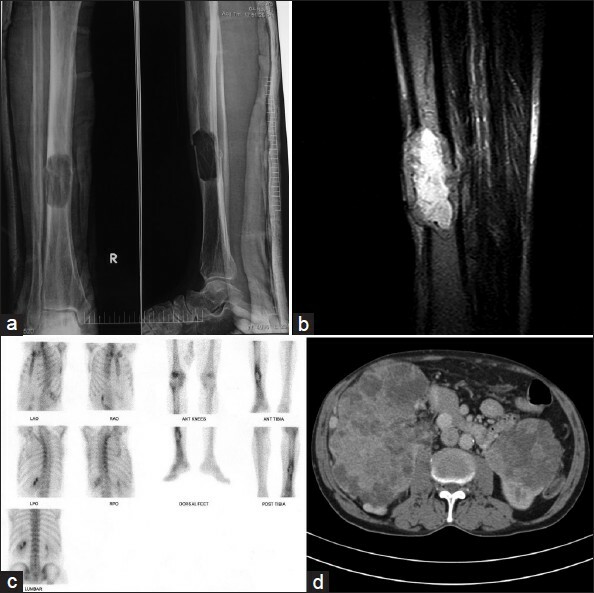 A total of 41 percutaneous biopsies were performed in order to establish a diagnosis for a suspected malignancy or an infectious complication of cancer treatment. Results and Conclusions: An accurate diagnosis was achieved in 21 of 26 (87.6%) percutaneous biopsies for suspected malignancy cases or recurrence. The remaining 15 percutaneous biopsies were done for the diagnosis of infectious complications of cancer treatment with an accurate diagnosis of 60%. Imaging-guided percutaneous biopsy technique is highly accurate and safe, particularly in diagnosis of a suspected tumor. Objectives: To investigate the level and determinants of posttraumatic growth in Iranian cancer patients. Materials and Methods: This descriptive-correlational design study was conducted within a university-affiliated oncology hospital in Iran. A convenience sample of 450 patients with a definitive diagnosis of cancer of any type completed a demographic questionnaire and a posttraumatic growth inventory. Some disease-related information was obtained from patients' medical records. Results: The mean of posttraumatic growth reported by participants was 76.1. There was a statistically significant association between experience of posttraumatic growth and age (r = − 0.21, P=0.001), education at university level (F = 8.9, P=0.001) and history of treatment by radiotherapy (t = 2.1, P=0.03). Conclusion: The findings of this study suggest that Iranian cancer patients experience a moderate to high level of posttraumatic growth and confirm the hypothesis that the level of posttraumatic growth in non-Western cancer patients is more than that of Western cancer patients. Although, assessing the reasons for this difference needs more investigations. Context: Pain and palliative care clinic (PCC). Aims: The primary object of this study was to enumerate the demographic characteristics of patients attending a newly organized PCC. The secondary purpose was to detect symptom prevalence and frequency of different cancers in these patients. Settings and Design: Prospective cross-sectional descriptive study. Materials and Methods: A prospective cross-sectional descriptive study was done on patients referred to the PCC of a tertiary hospital in North India. Comprehensive details of all patients were recorded systematically on the first visit on a proforma specially prepared for the newly established palliative care clinic. Statistical Analysis Used: The descriptive statistics of palliative care data was presented in terms of frequencies and percentages (%) for categorical variables. Results: The data collected at our PCC showed that out of 156 patients, 87 were males and 69 were females. Patients of all ages varying from 6 to 85 years were seen. Most patients (82.1%) lived with their families, and 28 (17.1%) patients lived alone and had no financial support. The most common primary diagnoses were head and neck cancers (38.5%), carcinoma cervix (15.4%), breast cancer (10.3%), colorectal cancer (6.4%), and lung cancer (4.5%). Frequency of seven most common symptoms was pain (100%), insomnia (64.1%), loss of appetite (34.6%), nausea (32.7%), vomiting (32.1%), constipation (31.4%) and sore mouth (28.8%). Conclusions: Population-based studies determine the actual magnitude of sufferers and suffering and show that palliative care services should be included as an essential component in a tertiary care hospital. The objective should be to reach out to the patient and help in improving the patent's quality of life in every way possible. Objective: Comprehensive statistics on gynecologic malignancies reported from India are deficient. This study was performed to ascertain the profile of gynecologic cancers reported at our center regarding incidence, histologic subtypes, frequency of involvement at various sites and stage at presentation. We endeavored to compare our data with gynecologic cancers reported at other national and international centers. Materials and Methods: Retrospective review of records of gynecologic cancers obtained from Departments of Pathology and Gynecology, at a tertiary care center, Delhi from January 2000 to December 2009 was performed. Comparison with international data was performed using Fishcher's exact test and chi square tests. Results: A total of 1315 gynecologic cancers were reported. Cervical malignancies were the commonest at our center as compared to uterine malignancies in data from Surveillance, Epidemiology, and End Results (SEER) Program of United States and European Union. All malignancies except cervical cancers affected a younger age group at our center than in the US population. Cervical cancer presented at a relatively more advanced stage, ovarian cancers at more localized stages, whereas uterine cancers presented at similar stages as compared to Western data. Conclusions: Our registry presents composite data from North India. Higher age and advanced stage at presentation of cervical cancers suggests lacunae in screening programs available. Ovarian malignancies were more localized at presentation than in the Western population for which environmental or genetic factors may be causative. 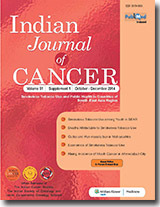 Purpose: The aim of this diagnostic observational study was to assess the spread and biological behavior of gallbladder cancer using 64-slice computerized tomography (CT) scanner in this particular geographic belt (eastern Uttar Pradesh, western Bihar, and northern Madhya Pradesh provinces of North India). Indians are ethnically and culturally different from their Western counterparts among whom the incidence of this disease is comparatively low. Subjects and Methods: After systemic examination, all patients (87) were subjected to ultrasonographic examination. All cases were histopathologically proven. Confirmed cases were subjected to volumetric CT examination of abdomen and pelvis, plain, post contrast and delayed phase. Results: Majority of the cases were adenocarcinoma. There was female preponderance with majority belonging to fifth and sixth decades. Commonest presentation was diffuse, irregular, enhancing wall thickening in 49.4%. Majority had invasion of liver parenchyma (74.7%). Cholelithiasis was seen in 48.3% cases. Invasion of biliary radicals was high (13.8-18.4%). Eleven cases had invasion of portal vein and tumor thrombus, with hepatic artery invasion in one case. In two cases, both hepatic artery and portal vein invasion was seen. 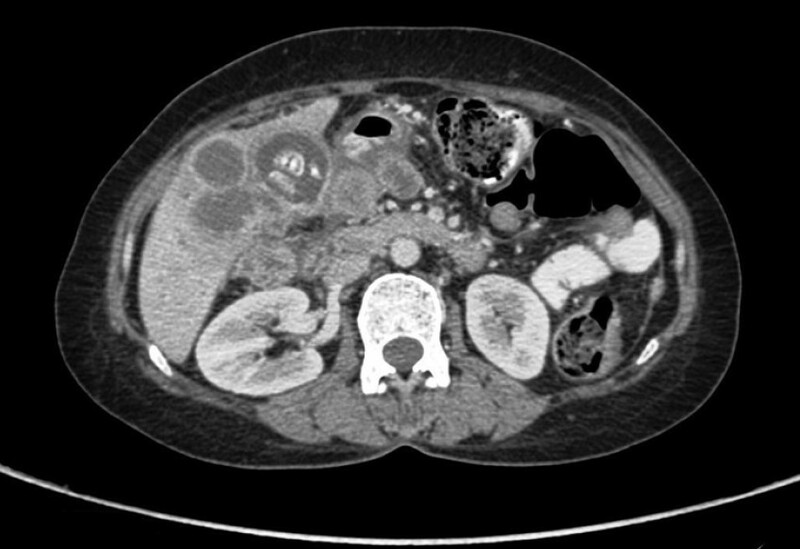 Portal and peripancreatic nodal metastasis was seen in 58.5%. Distant metastasis was reported. Conclusion: Few studies involving the Indian population have attempted to use multi-row detector CT to define the biological behavior of carcinoma gallbladder. The opinion whether the pathology is operable or non-operable can reasonably be given. This large-scale, single-center study gives insight about the epidemiology and biological behavior of carcinoma gallbladder. Background: Squamous cell carcinoma of head and neck (SCCHN) is a major concern of health risk in developing countries, such as India. Apart from genetic configuration, environmental and lifestyle factors, as well as poor oral hygiene, provide free radical-generating environment, which may contribute to the development of cancer through DNA damage. Materials and Methods: Here we ascertained the various oxidative stress determinants in diagnosed SCCHN patients with health risk addictions. This study further evaluated the incremental effects inflicted by these lifestyle factors on redox status. The study included 100 consenting SCCHN patients and 90 matched healthy controls. Salivary total antioxidant capacity (TAC), glutathione (GSH), free radicals: such as reactive nitrogen species (RNS) and reactive oxygen species (ROS) along with oxidative DNA adduct (8-OHdG) were monitored. 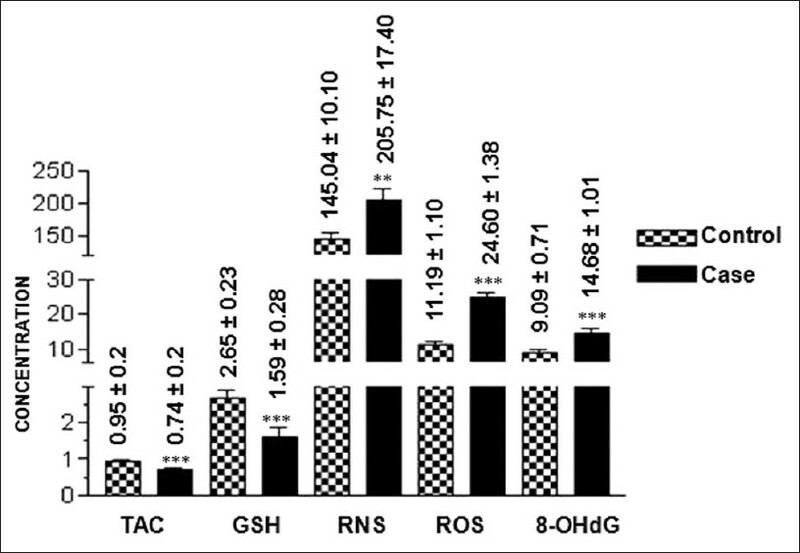 Results: Our findings indicated altered salivary oxidant-antioxidant status in SCCHN. A substantial rise in ROS (~2.0 folds) and RNS (~1.4 folds), together with significant lowering in TAC (~1.2 folds) and GSH (~1.7 folds) was observed. The 8-OHdG levels were also found to be considerably higher (P < 0.001) in salivary cell's DNA of these patients. Conclusions: Our results demonstrate significant redox imbalance in cancer patients suggesting their paramount importance in the development of SCCHN.